Ideally, install the Microsoft Web Platform Installer, which allows you to download and install Microsoft packages like those in this list (and their dependancies) with ease. 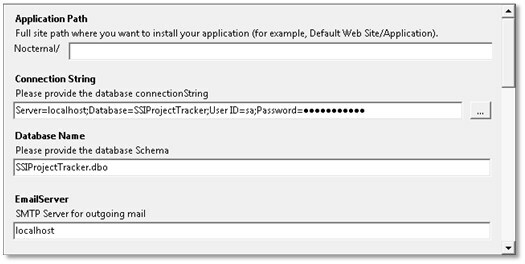 (Optional, project depending) The Application Initialization module may be required on versions of IIS earlier than 8. This is available via the Web Platform Installer. 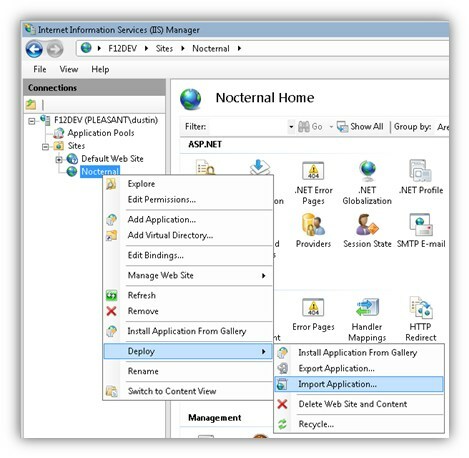 If you don't have an existing website, create one in IIS Manager. With the latest versions of IIS, the associated Application Pool is likely already set to .NET v4.0 (or v4.5) with the integrated pipeline option. If not, change the options on it. Browse to and select the .zip file containing the application and click Next, and Next again. If this Application links to a database, you will be prompted to enter the Data Source information here. Fill out any remaining fields with the appropriate information for your deployment enviornment. If the site requires database configuration, it should prompt during setup for the database type and connection string. Valid database types are usually "SQLite", "PostgreSQL", or "MSSQL", with connection strings such as "data source=C:\dbFiles\ABSite\AB.db", or "data source=dbsvr,1101;Initial Catalog=AB_Accounting;User ID=dbuser;Password=dbpass"
To simplify later upgrades, we recommend not putting local database files under the website Application directory itself. If the project involves report generation, you may have to edit the Advanced settings of the Application Pool for the website to have "Load User Profile" set to True. You may want to take advantage of the Application Initialization module. This can be configured via this guide.